Tenchi is out picking a field of carrots, and chasing Ryo-Ohki out of the basket before she can eat them all. 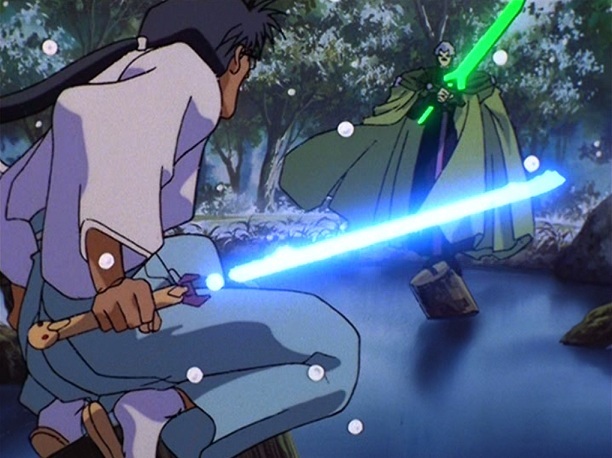 Ryo-Ohki suddenly shrieks and runs, which Tenchi writes off as her reaction to the season’s first snowfall. The massive ship of feared uber villain Kagato passes through space. It’s surrounded by Galaxy Police cruisers, but casually blasts them all away. The Marshall of the GP contacts the Commander of a station in the solar system in which Kagato is heading (ours), informing him of the incident and ordering a search for the villain. The Commander’s Lieutenant informs him the nearest officer is Mihoshi, which isn’t taken well as the Commander’s desk is littered with expensive damage reports from Mihoshi’s previous cases. Nonetheless, the Lieutenant suggests sending Mihoshi after Kagato might be an opportune way to get rid of her. In an old memory, Ayeka as a little girl picks a Royal Teardrop flower and gives it to her brother/fiance, Yosho, but he tells her it’s not a flower meant for happy occasions. Sudden chaos as we see the flaming devastation unleashed by a demonic Ryoko, who takes off in her ship, Yosho in pursuit. Ayeka, now grown, runs after Yosho, but when she reaches him, he becomes Tenchi. Tenchi tells her again that Yosho is dead and gives her the sword hilt as a memento. Ayeka wakes up with a yell, the sword hilt in her hand. She’s in a room at Tenchi’s house, Sasami still asleep on the futon next to her. Ayeka goes to the window, longing for Jurai, then sees Ryoko walk across the pond below. Ayeka turns away in disgust, while Ryoko submerges, pulling a black egg from the wreckage of her ship. A massive ship approaches Earth orbit. At its heart is a garden- and forest-filled capsule where beams of light are projected into a specific tree. A pair of robotic guards, Azaka and Kamidake, activate, and the base of the tree opens, releasing Ayeka, princess of the planet Jurai, from stasis. She’s come to Earth in search of her brother, Yosho, but neither he nor his ship are being picked up by scans. 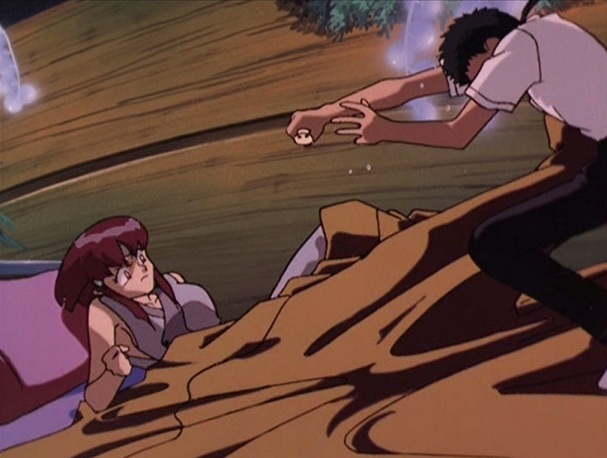 Instead, they find Ryoko. Due to the statute of limitations, Ryoko’s file is cleared five seconds later, meaning she’s no longer a wanted criminal. Ayeka is furious and damns the laws, ordering her ship to move in and capture Ryoko anyways. Since he was a child, Tenchi Masaki has wanted to sneak into the Masaki family shrine – the centerpiece of the temple/home he shares with his father and grandfather – but his grandfather keeps warning the boy away with legends of the demon who rests within. 700 years ago, the demon unleashed a wave of massive destruction, until a dragon-like ship came from the sky, bringing a warrior, Yosho, who sealed the demon in this cave with the power of a spiritual sword. Tenchi and his family are descended from Yosho and are tasked with guarding the shrine from intruders. The comedies were what first pulled me into anime. I’d of course seen Robotech and Voltron and a number of the other bowdlerized anime series airing in US Saturday morning cartoon blocks back in the day, but it wasn’t until I randomly came across an issue of Ninja High School on the magazine rack at the local mini market (remember when they used to carry comics? Good times) that I started to learn what these terms “anime” and “manga”, both still young to our nation’s ears, actually meant. Tracking down other issues of Ninja High School, I was hit with a crash course on the foreign elements it was parodying alongside the American action movies and teen comedies of the 80s, and I’d soon pass videos at the local blockbuster that were suddenly familiar. This is how I discovered Captain Harlock, Fist of the North Star, and re-evaluated my love of the above-mentioned Robotech. 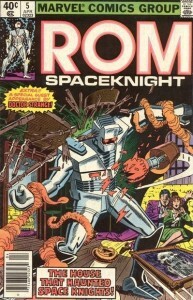 It even introduced me to sentai teams shortly before Power Rangers hit US airwaves. Most importantly, it introduced me to the most magnificent anime screwball comedy ever made: Project A-Ko. It was through my love of such adorable destruction that I started hording everything I could in the genre, diving into Rumiko Takahashi, and renting the first OVA of a series called Tenchi Muyo. While I loved Ranma 1/2, there was always a repetitive sameness to it resembling American sitcoms. 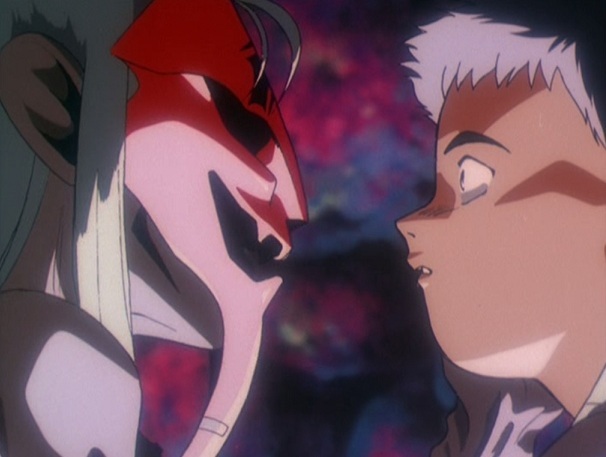 Tenchi, on the other hand, would go from Earth to the deep cosmos in the span of an episode. Anchored on a likeable “average Joe” lead, it took space pirates and rulers of planets-sprawling kingdoms, and brought them down to earth for domestic shenanigans as two women constantly fought over the affections of the hero. 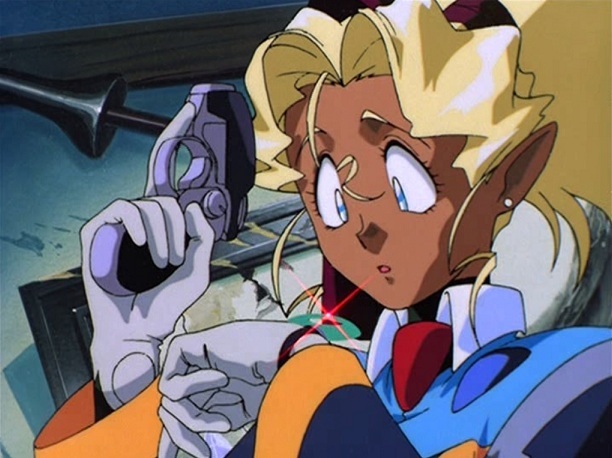 Tenchi was definitely an early player in the now unrestrainable harem anime subgenre, but it doesn’t quite fit those tropes as well as other concurrent works like Video Girl Ai or Ah! My Goddess. Tenchi quickly found himself surrounded by women, but they were rarely hyper-sexualized, and only two were actually treated as potential and mutually interested suitors. Asuka and Ryoko were the Betty and Veronica to Tenchi’s perfect gentleman Archie, with him lacking the hapless pervert tendencies one so often found in subsequent moe derivations, and the rest of the largely female cast had their own dynamics as they loudly crashed the story from scenario to scenario. This, at least, is how I remember the show. 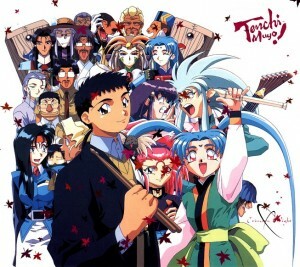 It’s been over a decade since I’ve last immersed myself in the world of Tenchi, and I never even finished the whole thing the first time around. I caught the first two waves of OVAs, a few volumes of the manga, the whole first tv series, and all three movies, but I never explored beyond that. 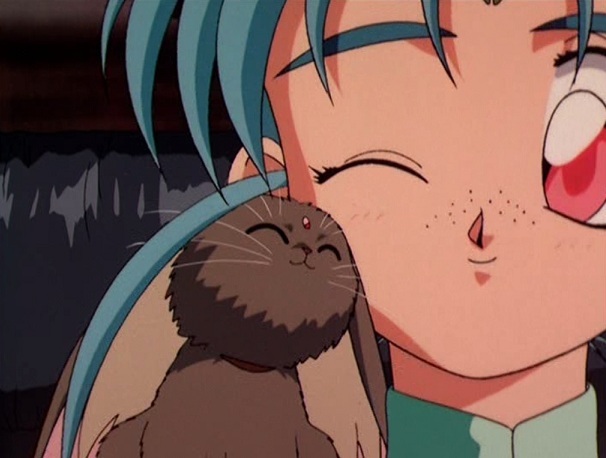 I never took a glance at Sasami’s magical girl spinoffs, nor followed Tenchi to Tokyo, nor even knew about the new cast of GXP, so this project is setting out to not only revisit one of my favorite anime of the 90s, but also fill in the gaps where I can. Was it as fun and catchy as I remember? Will I regret having not stuck with it for the long haul? Will it have aged poorly and drive me insane? We’ll see, and I invite all you other old Tenchi fans to join along, sharing your memories and opinions of the franchise as I work my way through. In the smashed out remains of Brandy’s laboratory, still littered with the shredded tendrils of the Thornoids, Rom and Brandy stand over Steve, who clutches the body of his friend, Officer Artie Packer. Other employees have gathered on the other side the locked door, trying to investigate the sounds they’ve heard. 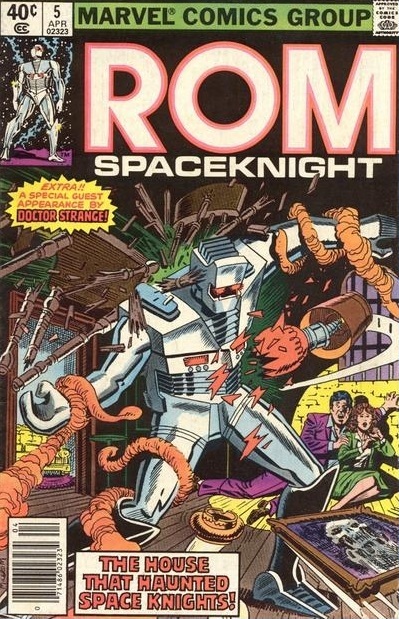 Brandy tries to get Steve to clear out, but he goes into a rage, blaming Rom for Artie’s death and screaming that they never should have trusted the murderous robot. 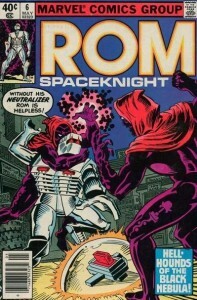 He says the Wraith had been silent and content in their human disguises on Earth, and only turned to violence when Rom showed up and forced their hand. It’s still night on that road just outside of Clairton, West Virginia. 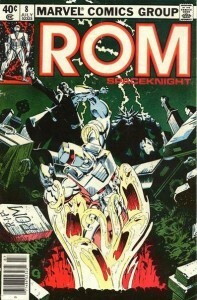 Brand, Steve, and Rom huddle in the woods while police comb through the wreckage from last issue’s battle. Rom isn’t sure if these people are human or Dire Wraith, but he can’t risk using his Neutralizer without giving away his position and endangering Brandy and Steve. 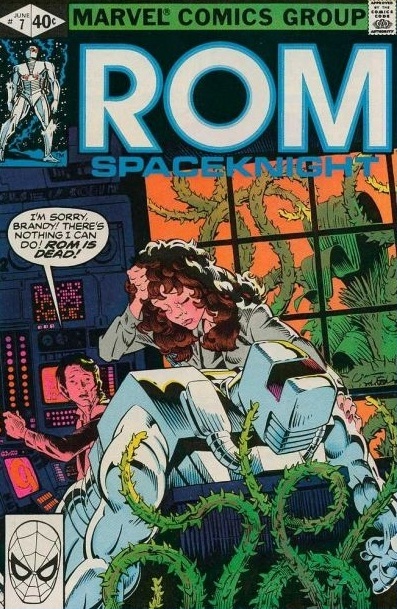 As he looks to Brandy wrapped in Steve’s arms, Rom thinks back to the day he volunteered to become a Spaceknight, when his girlfriend Ray-Na confronted him over the choice to give up his humanity and their love.